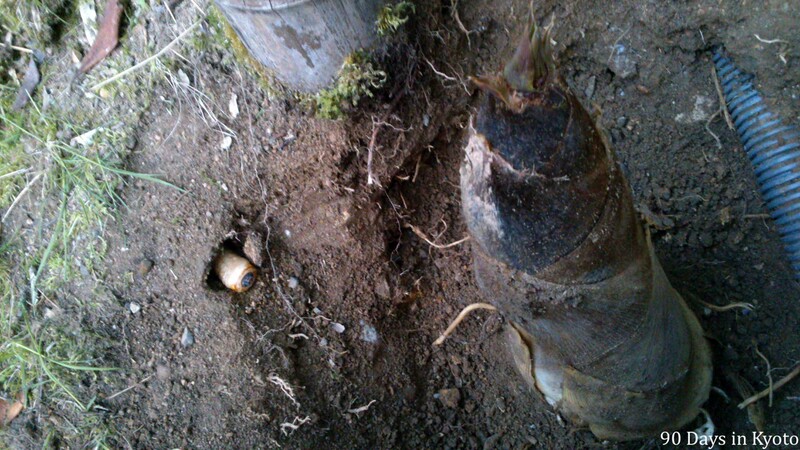 I was digging out a bamboo shoot (take-no-ko, 竹の子) this evening and woke up the larva of a rhinoceros beetle (kabuto-mushi, カブト虫). You have to know that they are big, really big. The diameter is probably wider than 1 centimeter. I was a little surprised when I saw it. Sazaki-kun told me that I shouldn’t touch it (as if I would do so), because if the larva is touched in this stage, the beetle will have a different shape later. I hope this big white Kabuto-Mushi larva will become a nice rhinoceros beetle later in life.